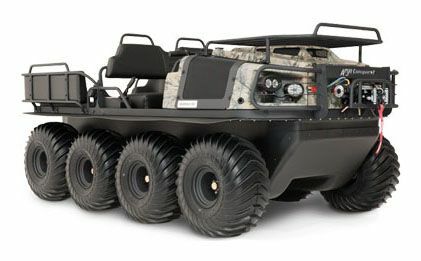 Designed to meet the specifications of hunt camp operators, lodge owners, and big game guides who traverse the world’s toughest terrain, the new 2018 Argo Conquest 8×8 Outfitter is a hunter’s dream come true. Built on the XTI platform and powered by a 30 hp 747 cc electronic fuel-injected Kohler engine coupled with an efficient ADMIRAL steering transmission for great performance in challenging terrain, the Conquest 8×8 Outfitter is unlike any other off road hunting vehicle on the market. ENGINE: Dependable Kohler gas engines deliver sure starts in any climate conditions, including high altitudes. 7.1 gal. (27 l) See through polyethylene fuel tank. 8 hours of operation. One-piece, ergonomic handlebar. Steering control features hand brake. 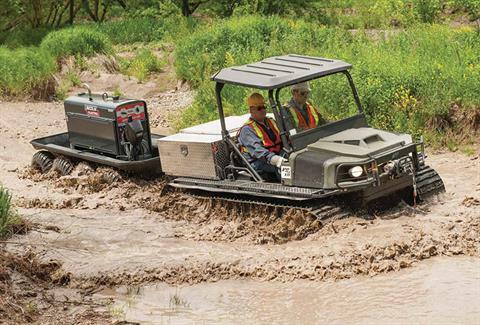 For safety and ease of handling, the Argo steering transmission provides continuous torque to all axles.